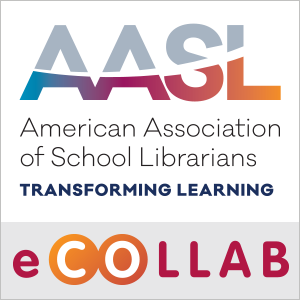 AASL eCOLLAB | Your eLearning Laboratory is a repository of webcasts, podcasts, and other digital resources from AASL, including the latest issue of Knowledge Quest. eCOLLAB provides a central location to collected and manage your elearning, on your time and at your pace. This collection contains archives of AASL webinars, recorded concurrent sessions from AASL national conferences prior to 2015, and national institute presentations. Register for live webinars on the Upcoming Events page. AASL offers online learning opportunities to meet the needs of busy school library professional. Online professional development available through eCOLLAB is designed to make school librarians leaders in their school community. 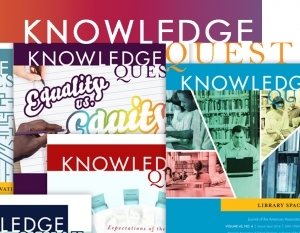 Published bimonthly September through June, Knowledge Quest is devoted to offering substantive information to assist building-level school librarians, supervisors, library educators, and other decision makers concerned with the development of school library programs and services. This collection contains issues dating back until 2011. Archives issues back to 2008 can be accessed via ERIC. 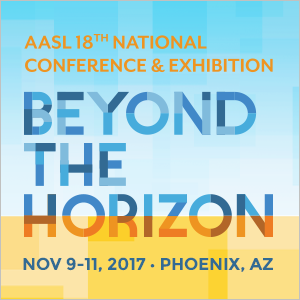 The AASL National Conference & Exhibition is the only national conference devoted solely to the needs of school librarians. Concurrent sessions are specially chosen to empower leaders to transform teaching and learning. Sessions in 2017 introduce the new National School Library Standards, raising the level of learning in school libraries, and addressing the needs of a new generation of students.